Separating work and personal life is a herculean task when you are building a company. But it gets even more challenging when your personal space becomes your work space too. This is a challenge a lot of start-up founders are familiar with, especially when they find that the first casualty of this inter-flow is the dining table which transforms into a workstation. 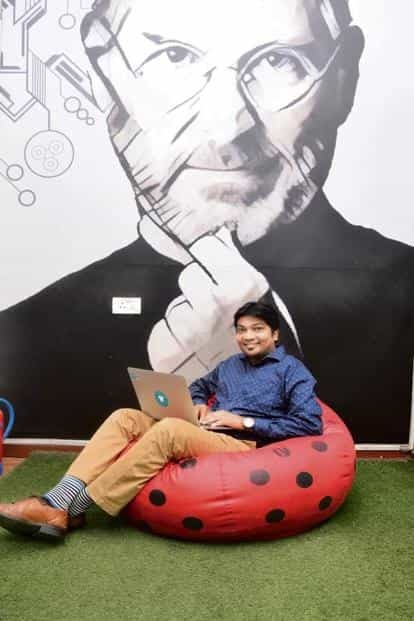 “It gets very difficult to bifurcate personal and work life because work hours stretch crazily, especially when it’s peak season or delivery deadlines are looming," says Utsav Bhattacharjee, co-founder of Reculta, an HR tech start-up, who shares his three bedroom duplex apartment in Delhi with three people who work in Reculta. Bhattacharjee, 30, now has become very particular about maintaining a routine. “It doesn’t matter who is up or not. I finish breakfast by 9.30am and make sure I am there to welcome the other team members when they walk in because if there is no one to open the door, people feel irritated. I also make sure that they don’t walk into a completely disarrayed house. It’s a ritual that I have internalized," he says. The other thing he’s trying to inculcate is to make sure his non resident staff leaves by 7pm. “These are small things but it also helps us, who are living here, to have some personal space," he says. Recalling the time when he began his start-up from his three bedroom apartment, Ankit Jain, co-founder of cloud-based call management system, MyOperator, says that he would lock his bedroom, which he shared with his co-founder and brother, and would open it again only at night when everyone had left. This made sure his personal space remained intact. Having no fixed timings meant people coming in at all hours. “A lot of times it would be difficult, especially if someone decided to come early to office. Then there would be some guys who would cook food in the kitchen and make the place messy. But, you have to compromise on those things," he says. Like Bhattacharjee, Jain was also personally disciplined about certain things like dressing up formally. “In fact, I wear more informal clothes now than what I used to when I was working from my home," he says. Hard-pressed for funds, working from home suits a fledgling company provided you have a good relationship with the landlord or the owner of the apartment. “No one really rents out their residential property to a bunch of start-up guys. We were lucky that we found a house, where we knew the owner personally," says Bhattacharjee. The start-up has now found a commercial space within 100 metres of their current property, where they will move by early next year. While Bhattacharjee and his two co-founders were upfront about their intentions, Jain’s start-up began in a covert manner from his flat in Dwarka, New Delhi. As the team grew, Jain was “kicked out" after some of his neighbours complained about the constant flow of people visiting the apartment. “Since, it was an apartment on the ground floor, the sales team would spend the whole day at the adjacent park making calls. Probably the society people complained about this," he says with a laugh. According to Jain, one of the advantages of starting from an apartment was that “it acted as a good filtering criterion". He recalls people coming for interviews and turning back when they saw the office was a residential flat. It was only after the first five employees and a prototype of the technology was ready, that the rejection ratio dipped. At Reculta, the founders faced another issue. The team had two women and as more employees, mostly men, were added, it became imperative that washrooms be separated. “The men were just not concerned about keeping the washroom clean. So we demarcated one of the toilets as ‘women only’," he says. The employees may adjust to the informal setting of an apartment with makeshift workstations. But what about clients meetings? Ambika Satapathy, 29, co-founder of Odisha-based ZooFresh Foods, an agri-tech start-up, says she prefers to meet clients’ at their office. At Reculta, they have hired a few seats in a co-working space, despite it being a drag on their resources. “It is necessary not only to keep up appearances but also to make sure that we were keeping the team insulated from such meets. When the team sees a client coming in, the entire atmosphere changes," says Bhattacharjee. Jain recounts an incident when a potential client from Chennai insisted on coming to the office before making the payment. “I didn’t have enough employees and I couldn’t buy a new place overnight. The best I could do was make my apartment look more like an office. So, I asked a few friends to come over and help me with this, which they would later describe as the ‘Munnabhai makeover’," he says. Jain put up “official" posters about timing, regulations found through Google, everywhere in the flat. “My friends stayed back so that it looked as if we had more employees," he says. In the end, the client was impressed and invested ₹ 2 lakh, which acted as seed money for Jain. Both Jain and Bhattacharjee strongly discouraged their parents and relatives from staying with them or disturbing them during work hours. Meanwhile, Satapathy, who stays close to her in-laws has no such luck, so she has set up a few ground rules to ensure the in-laws and relatives take her work seriously. “I have made it clear that I can’t run any errands or attend family functions from Monday to Saturday between 10am and 6pm. Another thing I have put in place is no official visits after 9pm and before 9am," says Satapathy, who works out of her two bedroom bungalow with sprawling lawn and backyard in Kalahandi, Odisha. Although home office may have the comfort and the freedom, as a company grows, the founders have felt the need to shift to a formal office space. “Initially, a lot of people, who had worked with us in the apartment, weren’t comfortable working in the new office environment. They felt the apartment environment was better because we had the comfort, there were no timing issues and one could sit anywhere one wanted to. But we have to leave behind certain things when you’re growing and move forward," feels Jain. Satapathy’s reason to move to an office space is different. When the team increases, which it will in the coming months, she believes that she will lose the privacy of her home. “Also, for my employees, in order to find the company an attractive employer, I want an office environment. And especially in a small town, it’s a status symbol for them to tell their relatives, friends, clients that they work in an office rather than in someone’s home," she says.